← Who Wins When the Fed Hikes in December? Dow and S&P 500 Index up marginally Friday, capping fifth straight positive week for the S&P 500 as earnings optimism buoyed sentiment. Technology led sectors; utilities, telecommunications and financials lagged on mixed bank earnings. For the week, real estate (+1.8%) topped all sectors, while telecommunications (-4.6%) and financials (-0.9%) underperformed . Markets continued to calmly digest policy headlines, including President Trump ending ACA cost-sharing payments, the risk that U.S. leaves NAFTA, and Iran nuclear agreement controversy. Meanwhile, the tax reform debate rages on. One exception-ACA news weighed in health insurers. Treasuries rallied Friday, pushing the 10-year yield down to 2.28%. WTI Crude Oil +1.7% to $51.45/bbl. Friday on a drop in the weekly rig count and well-received weekly inventory data; WTI +4.5% for the week. Expectations for Saudi-Russia production caps to be extended also providing support. U.S. stocks opened slightly higher as busy week of earnings gets underway while investors focus on the Federal Reserve (Fed), tax policy, geopolitics. European markets mixed (STOXX Europe 600 +0.1%)–Spanish equities continuing to underperform; Catalonia deadline to negotiate with Madrid is Thursday, October 19. DAX +0.2% after German state elections weakened Merkel’s position. Asian markets higher, MSCI Asia-Pacific Index up seven straight days to a near 10-year high. Nikkei, Hang Seng, ASX 200 all closed >+0.5%. Treasuries off slightly, 10-year yield +1 basis point (0.01%) to 2.29%. Commodities – Oil +1.4% to over $52/bbl. after Iraq’s military seized a refinery and gas plant in an oil-rich Kurdish province in Iran. Copper above $7000/ton for first time since 2014 on strong Chinese producer price data, comments from a Chinese official suggesting 7% gross domestic product growth in the second half is within reach. U.S. dollar higher after Fed Chair Janet Yellen’s comments over the weekend maintained expectations for a December rate hike. Euro is down slightly, yen largely unchanged. 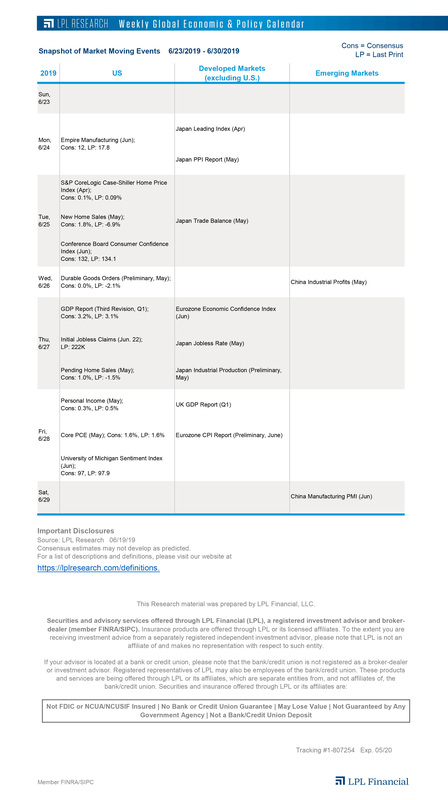 Today’s economic calendar – U.S. October Empire Manufacturing (30.2 vs. 20.4 expected and 24.4 in October). Could the 1987 crash happen again? Conditions are very different today than they were in the days leading up to the 1987 crash. We believe that the stock market is on a much stronger fundamental foundation today, making another crash extremely unlikely. The latest rally has not been nearly as steep as 1985-1987, interest rates are much lower today, and sentiment is not as frothy. The system is much stronger today. Crashes and crises are unfortunate but past “stress tests” have provided opportunities to strengthen the system. While it can be debated whether regulations and market structure have been improved, we believe that better transparency and more liquidity today are not debatable. Investors have better access to information and can trade much more easily. Earnings season is off to a good start, though early stats are a bit misleading. As shown in our first earnings season dashboard of the season, the beat rates for both earnings and revenue are very strong so far, both at over 80%. But with just 32 companies having reported, hurricane impacts dragging down financials, and estimate reductions in the days leading up to the start of the season, it is too early to celebrate. Since October 1, energy has produced the most upside to third quarter estimates, while financials have produced the most downside–financials’ third quarter figure has been revised down by 9% during October. This week 55 S&P 500 companies will report. This week marks the 30th anniversary of the 1987 crash. On October 19, 1987, in what has come to be known as Black Monday, the Dow plunged more than 22%–the equivalent of a more than 5000-point drop today. In this week’s Weekly Market Commentary, we look back at the crash, draw some comparisons to today’s market environment, and offer some comfort to those who may fear a repeat. Inflation is the key to the Fed’s next move. Inflation has shown signs of stabilizing over the last several months while wage pressure has picked up modestly, although Hurricanes Harvey and Irma may have had some impact on both. The Fed’s minutes from its September meeting, released last week, showed a lively internal debate on the expected path of inflation. Further stabilization in inflation and some pick-up in wage pressure should allow the Fed to follow through on its projected path of one more rate hike in 2017 and three in 2018. We’ll be watching inflation and wages closely to gauge whether it will be able to stay on track. Our Weekly Economic Commentary, due out later today, will explore in more depth. Looking at new highs. 2017 has been a record-breaking year for equity markets, as many new highs have been made in the process. Today on the LPL Research blog we take a closer look at where the 44 new highs for the S&P 500 (and other indexes) this year stand all-time. More of the same. The S&P 500 closed slightly higher and barely missed a new all-time high on Friday. What stood out once again was the lack of overall movement on the day. In fact, the S&P 500 traded in just a 0.22% daily range, the smallest daily range for a day during the usually volatile month of October since 1993. With just over 50 trading sessions left, the average daily range in 2017 has been only 0.52%, which would be the lowest ever–breaking the previous record of 0.71% in 1993. Make that five in a row. The S&P 500 closed higher for the fifth consecutive week last week, the longest win streak since six in a row during the first quarter. Be aware though that this type of strength can continue, as the 14 times since 2009 the S&P 500 has been up five straight weeks, it was higher a month later 10 times and up 1.0% on average.